The Andrews Sisters were an American close harmony singing group of the swing and boogie-woogie eras. The group consisted of three sisters: contralto LaVerne Sophia (July 6, 1911 – May 8, 1967), soprano Maxene Angelyn (January 3, 1916 – October 21, 1995), and mezzo-soprano Patricia Marie "Patty" (February 16, 1918 – January 30, 2013).Throughout their long career, the sisters sold well over 75 million records (the last official count released by MCA Records in the mid-1970s). Their 1941 hit "Boogie Woogie Bugle Boy" can be considered an early example of rhythm and blues or jump blues. The Andrews Sisters' harmonies and songs are still influential today, and have been copied and recorded by entertainers such as Bette Midler, Christina Aguilera, Pentatonix, and others. 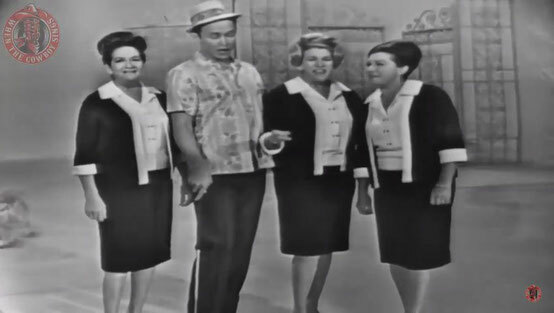 The group was inducted into the Vocal Group Hall of Fame in 1998.Writing for Bloomberg, Mark Schoifet said the sisters became the most popular female vocal group of the first half of the 20th century. They are still widely acclaimed today for their famous close harmonies.